Forget the Richter scale, Tokyo’s Minato Ward has a far more helpful and amusing scale for judging earthquake intensity, their Seismic Intensity Scale. This scale could probably be used to measure intoxication…with similar results. Scale zero is pretty self-explanatory. Not sure I follow the graphic, though. 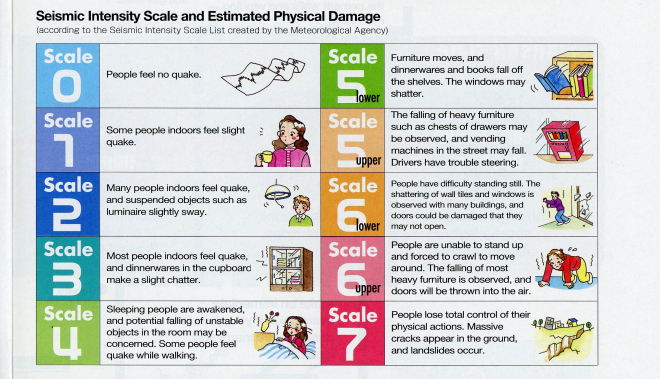 This scale is similar to the Mercalli intensity scaleメルカリ震度階級, which measures the effects of an earthquake on a 10 or 12-point scale.